Utranazz range of self-loading concrete batching plants are ideal for pre-cast yards, building sites and operations that require concrete production 24/7. 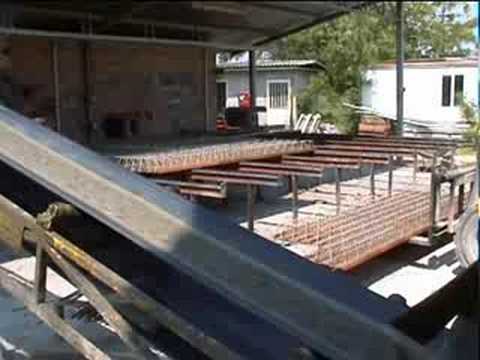 The plant is fitted with a radial scraper that loads the aggregates into a weigh hopper via a 12 recipe programmable computer. 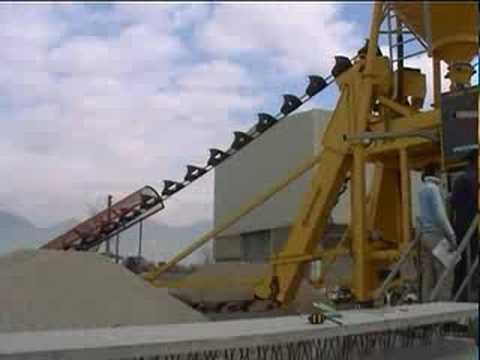 It then discharges the aggregates from the weigh hopper into either a pan mixer; drum mixer or dry belt conveyor. All of Utranazz self-loading batching plants are semi-mobile and can be supplied with or without cement silos or bag splitters. They can be electrically powered or diesel driven with computer weighing systems having a capacity of up to 36 different programmable settings, manual, semi-automatic or fully automatic control panels, water systems and the option of ad-mixture plants. This has outputs from 15-30 cubic metres per hour and can be supplied in 3 different sizes 0.5, 0.75 and 1 cubic metre wet concrete output. Ideally suited to working on the jobsite it is able to discharge concrete into dumpers or can be fitted with a specially adapted crane skip cradle, which automatically operates the mixing and discharging of the drum. 2. The Robomescolatore (fitted with a Pan Mixer). With outputs of 8-25 cubic metres per hour it can be supplied in 3 sizes 0.4, 0.75 and 1 cubic metre wet concrete output. Ideally suited to use in precast yards, the Robomescolatore is capable of producing any type of concrete from low grade to high quality P.Q. (pavement quality) concrete. Discharge is via a single hydraulically operated hatch that can be adjusted to suit most heights. 3. The Hydromix CBR Batcher (a dry concrete batching plant to supply a concrete mixer truck).